Welcome to the second installment of the Backgrounder series! I’ve expanded the scope of these posts to include regions and peoples in addition to monsters, and the first post up is also the first one ever polled from the POCGamer fanbase. So let’s talk about Durpar. This was a bit more challenging than anticipated, so I’ve broken it into two parts, the first being an overview of what’s known about Durpar, the second being a theoretical framework to introduce Durpar into your campaign or as a subsetting in your campaign. 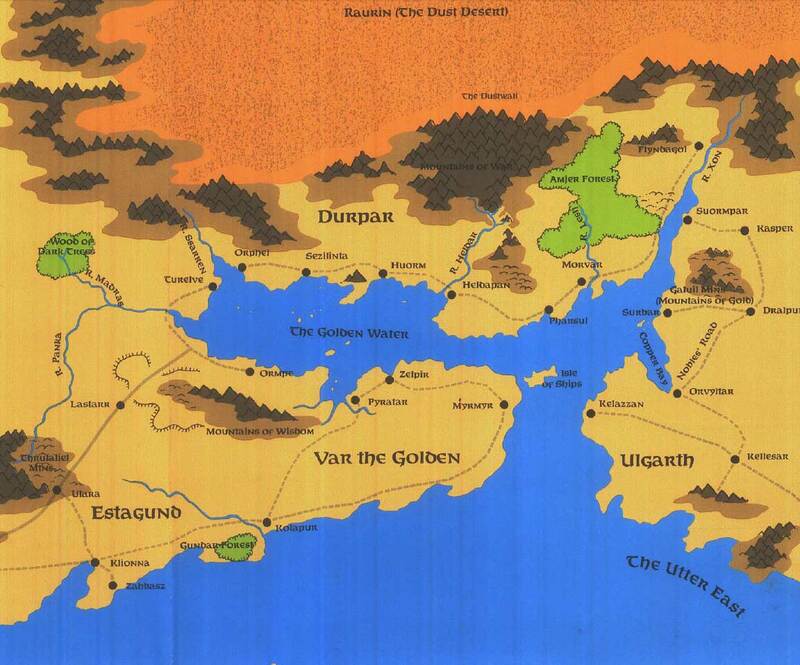 Durpar is located in the southeastern region of Faerûn, south of the Old Kingdoms and near the region known as “The Utter East”. It’s so far off the beaten track for most adventures that I’m fairly confident in saying that few people have heard of it, fewer have run an adventure there, and even fewer have made a character from there. Durpar is sandwiched between the Raurin Desert, and the Giant’s Belt and Dustwall Mountains to the north; Veldorn to the west; Estagund, Var the Golden, and the Golden Water to the south; and Ulgarth to the west. Along with Var the Golden and Estagund, the area is collectively known as “the Shining Lands” of “Lands of the One”. Regionally speaking, Durpar is located in an area uniquely positioned in the larger context of Toril, being near the juncture point between Faerûn, Kara-Tur, and Zakhara. Durpar is, broadly speaking, coded as a South Asian culture. Specifically, it appears to be a hybrid of Mughal dominated India, with a modified Buddhism vibe in the form of the guiding philosophy of “Adama”. This is mixed liberally with a heavy dose of capitalism and mercantilism as the driving forces for everything in their culture. Broadly speaking, there isn’t much more to go on. The art for Durpar I could find was woefully whitewashed or surprisingly East Asian-ish (? ), and largely pointless, or was literally of white people with “exotic” sounding titles and in generic D&D fantasy outfits. Based on the climate, use of terms like “Maharaja” and so on, I’d place their dress, arms, equipment, and so on on the South Asian part of the spectrum. I’d include food and so on as having inspiration from that region as well. Durpar has history? Sort of. The history for Durpar is exceedingly simplistic. The area now known as Durpar was dominated by the ethnically related but culturally different Imaskar, had an obligatory “dark age” when Imaskar fell, and was finally founded around -623 DR. Then ??? ?, followed by becoming the most successful, well supplied, cosmopolitan merchant state that you’ve probably never heard of because everything focuses on Waterdeep, Neverwinter, Tantras, and Westgate. The sad part is that I’m not exaggerating. Durpar should have some serious history attached to it, but it’s got less going on than Dambrath, despite all the events around the place and it’s purported unmitigated success pre-Spellplague. Much like other POC dominated/majority areas in Faerûn, the 4e era was not kind to Durpar. Already barely a barely more than a footnote in the Shining South books of previous editions (which were much more focused on Halruua), Durpar was spared physical destruction, but was turned upside down elsewise. A single merchant chaka opted to abandon Adama for no reason, wage a civil war, and establish a new dominion over the place, then establish some strange crystal…thing. It was a development left hanging by the truncated nature of 4e. Durpar’s state in 5e is a mystery. The Shining South regional coverage in the Sword Coast Adventurers Guide only made it to Luirien and Dambrath, leaving out the Lands of the One and Utter East completely. Durpar has two distinct cultural phases, and the one in use in 5e is not clear. The underlying vibe of old Durpar was a nation that has achieved a level of enlightenment by embracing Adama, a philosophical faith and way of being. Adama is the Forgotten Realms equivalent of a simplified Buddhism mixed with Islam, with an origin story more akin to Islam’s. While it does acknowledge gods (it has local names for several mainstream Faerûnian deities), it also introduces concepts like reincarnation to achieve perfection and the idea that all things are simply part of, or aspects of, Adama. The other cultural aspect is rampant capitalism and mercantilism. Durpar is all about a merchant elite and making money. The issue then was that the culture of old Durpar is somewhat at odds with its success as a merchant power in the region. Unbridled capitalism and mercantilism generally don’t mix well with a culture that is adverse to lying, stealing, and deceptive practices. Particularly when their trade partners are not so encumbered. There’s also an problem around some many of the POC cultures in Faerûn being described as being ruled directly or indirectly by a merchant class (Port Nyanzaru/Chult, Turmish, Tashalar, Durpar, Estagund). It’s an odd trend that is worth looking into in a separate post. Much of what was Durpar was discarded in 4e D&D, when Durpar was turned into a merchant oligarchy after a brief civil war. In 4e’s drive to make everything to do with POC as awful as possible, Durpar was stripped of its semi-enlightenment and turned into an evil-ish merchant oligarchy dominated by a single (presumably evil and doing evil sorts of things) merchant house, the Datharathi. This chaka (the Durpari term for a collective/group/social unit) broke hard from the teachings of the Adama and steamrolled the place, and now rules with a harsh and heavy hand. Interestingly, the Datharathi have integrated a significant non-human population into Durpar, in the form of goblinoids. The Datharathi maintain a large standing army that makes heavy use of Goblins, Hobgoblins, and Bugbears. Their presence has a mixed effect on the Durpari, as they are both protecting the populace from the monsters outside the cities and towns, and are also a heavy handed army of occupation keeping everyone in line. However, it is still the only region I am aware of where goblinoids are a part of a human society in any form that has potential to be non-antagonistic. New Durpar’s culture is more “traditional” as far as western fantasy goes. Cruel, hard nosed merchants with growing inequity and desperation appears to be the new norm for Durpar. Durpar has a lot of interesting stuff going on economically. Its exports include red and purple coral jewelry (this is actually an IRL thing as well, and insanely popular; people love coral jewelry! ), and coffee that is grown there and only there. The presence of coffee is a big thing, since the region may be the only source of it on Faerûn. Agricultural products, and likely maricultural ones, make Durpar, and the larger region it’s part of, breadbasket to its potential trade partners. This is unchanged through the editions. Durpar has lots of potential, but like other areas that fall outside the adventure triangle of The Sword Coast, The North, and the Heartlands, it is dreadfully underdeveloped. Adama is a cool concept, as is the introduction of renaming deities to show how they are recognized differently by different cultures. That latter thing is something that I think would have greatly simplified the chaotic and confused mess that is the cosmology Forgotten Realms. Back on track though, Durpar and the Lands of the One have a lot of potential. Between their location and what few events they’ve been a part of, Durpar could be a great spot to be from or adventure in. Part 2 coming soon! All images used here are property of Wizards of the Coast. Reminds me of northern india region. Merchant princes mixed w religious quarrels (Islam, Buddhism, Hinduism, and, later, sikhs). The 4e awfulness aside, could be very fun to play in. I imagine politicking and sinbad-esque merchant voyages along that coast line. India has been woefully underrepresented in d&d. Thanks for this post; Reminds me that there’s a lot of barely explored dnd territory out there still.